A track record of smart advice since 1905. People say that you should never forget where you came from, and at William H. Talley & Son, Inc. we live by that philosophy every day. We strive to offer the same caring, friendly service today, as we did on the very first day. 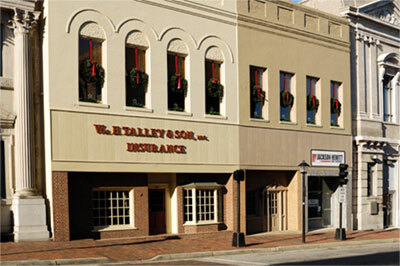 The general insurance agency of William H. Talley & Son, Inc. was established in May 1905 by William H. Talley, Sr. to provide all lines of insurance. 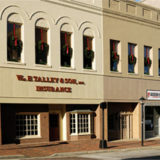 The well known agency of William H. Talley, 126 N. Sycamore St., Petersburg, Va. office 5 and 6 of the McIlwaine Building, was established in 1905 and controls a large and high grade clientele. Mr. Talley handles all legitimate lines of insurance and represents a number of the oldest and soundest companies in the world, in fire, life, health, accident, liability, plate glass, burglar and bonding. Mr. Talley is reckoned to be one of the best authorities on insurance in this section, and is prominently identified with the best interest of this place. Mr. Talley was the first United States General Agent for Virginia and Eastern North Carolina for the General Accident Fire & Life Assurance Corporation of Scotland. William H. Talley, Sr. was a descendent of William Talley who emigrated from Wales to New Kent County in the Colony of Virginia about 1665. William Talley, Sr. was born in Petersburg, Virginia on July 4, 1853. Mr. Talley was active in the business with his sons until his retirement in 1925. He passed away on March 9, 1929. William, Sr.’s oldest son, Joseph M. Talley, joined his father in the family business in 1913. Joe specialized in the life insurance business with the agency and was a leading producer for The New York Life Insurance Company. Like his father, Joseph Talley was also very active in the civic and business community of the city until his death in 1936. His second son, Francis H. Talley, became a member of the firm in 1916. Frank was known throughout Virginia for his expertise in the property, casualty and liability insurance fields. Mr. Talley passed away in 1945. The youngest son, William H. Talley, Jr., joined his father and two older brothers in the business in 1921. 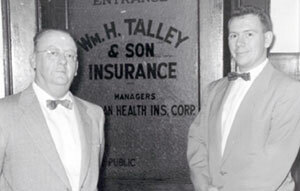 Mr. Talley was a general practitioner in the insurance business. In the early 1930’s he foresaw the emerging need for hospitalization and disability insurance for individuals and the employees of businesses. The firm became a Managing General Agent for several life and health companies and was one of the first third party administrators for underwriting health insurance and paying hospitalization and disability claims in Virginia and North Carolina. These insureds became clients of the personal lines and commercial lines departments of the agency. The firm met the challenges of the changing economic times of the teen years of the new century, the Roaring 1920’s, the Depression Years of the 1930’s and World War II in the 1940’s. An example of how lifestyle and legislative changes can create a need for insurance protection is the automobile. After World War I, the automobile steadily became a necessity for the masses of the population; subsequently, the first Financial Responsibility Laws were passed in Virginia in the early 1940’s. The new laws required an automobile owner to purchase liability insurance in order to comply with the Financial Responsibility Laws of the Commonwealth of Virginia. There was rapid change in the types of innovative insurance contracts in the property, casualty, health and life insurance business from 1945 to 1960. This time period was to become known as the birth of the Baby Boomer Generation. 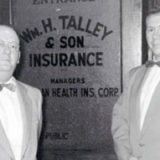 William H. Talley & Son, Inc. continuously kept up with the insurance needs of its clients. In June 1950 William H. Talley, III joined his father in the business while still a student at Randolph-Macon College. In 1952, Bill, III graduated from the Richmond Professional Institute of the College of William & Mary with a BS Degree in Business Administration and was called to active duty in the United States Army during the Korean War. He was released from active duty in September 1954, and joined the family firm. In June 1954 William H. Talley, Jr. suffered a heart attack which forced him into retirement. The challenge of increasing the new business sales requirements of the agency while also servicing the needs of the current clients was met by the “novice” agent with on-the-job training. A new package policy was introduced in 1956 for personal lines in Virginia, and it was called the “Homeowner’s Policy”. This policy packaged Dwelling Coverage, Personal Property Coverage, with Broad Perils Coverage, which included Theft, Additional Living Expense and Personal Liability Coverage with a discounted premium for the insured. In 1955 the life insurance industry introduced the new “Family Life Insurance Policy”. This contract provided life insurance coverage for Dad, Mom, and all Children under one policy for one premium, with additions to the family automatically covered. The children were guaranteed coverage until age 25, with conversion at that age to their own individual policy. In 1957 a Virginia company, the Atlantic Life Insurance Company, brought to the health insurance market one of the first Major Medical polices in the United States for the individual insured. This was a Guaranteed Renewable Major Medical Policy for life, with the heretofore unheard of high limit of $10,000.00 coverage per accident or illness and a high deductible of $500.00 per accident or illness. In 1959 the new Commercial Package Policy followed the Homeowner’s Policy. This one contract placed the Property, Liability and Inland Marine Insurance Coverage under one policy with a premium discount for the business owner. These forms of coverage were previously written only under separate insurance policies. The new contracts cited above became excellent marketing opportunities for the new agent. William H. Talley & Son, Inc. met these new challenges and changes in the commercial lines, personal lines, and life and health insurance business under the leadership of Bill Talley, III. This agency was one of the early agencies to departmentalize personal insurance, commercial insurance and life, health and group insurance. In 1963, the William H. Talley & Son, Inc. moved into a new office located at 148 N. Sycamore Street. The 1970’s brought the state requirement of open competition, in regard to the pricing of insurance, into the personal and commercial insurance business. This was followed by the hard markets of the 1980’s and then the soft markets of the 1990’s. The 1980’s and 1990’s also brought major changes in the life, health and financial services business; the changes came as the result of the economic challenges during this twenty year period. The 21st century brought in the long awaited hard market for commercial and personal lines of insurance. There will always be change in the business world, and William H. Talley & Son, Inc. is ready to meet the new opportunities. The responsibility for the leadership of William H. Talley & Son, Inc. was passed to the fourth generation when William H. Talley, IV was named President and CEO in 1999. Bill Talley, IV graduated from the Virginia Military Institute in 1977 with a BA Degree in Economics and joined the agency. He has been responsible for its growth and profitability over the past 30 years. William H. Talley, V joined the agency upon graduation from the Virginia Military Institute in 2003 and became the fifth generation to be a part of William H. Talley & Son, Inc. Success of any business is due directly to the great people who provide good service to their clients throughout the years. We are thankful for and indebted to our management team, sales associates, our customer service representatives, bookkeepers, secretaries and file clerks who have served William H. Talley & Son, Inc. over the past 100+ years. Today our agency is fortunate to have talented and experienced insurance professionals in our Personal Lines Department, Commercial Lines Department and Group, Life and Financial Services Department. We have special, gifted and knowledgeable associates who have provided decades of devoted service to our clients, our agency and the insurance business. We are indebted to the outstanding companies that have partnered with William H. Talley & Son, Inc. over the past 100+ years. Their marketing representatives, underwriters and claims professionals are invaluable allies in our pursuit to provide for the insurance needs and security of our clients, friends and neighbors. While our history & legacy is something that are proud to share. The team at William H. Talley & Son, Inc. know and understand that it’s not we did yesterday that matters the most, but rather what we do today & tomorrow.